Samsung on Monday announced it has shipped more than 100 million Galaxy S phones since May 2010, when the original Samsung Galaxy S Android smartphone was released. The first Samsung Galaxy S topped 24 million shipments, with the first 10 million in seven months. In 2011, the Galaxy S II reached 40 million shipments, and the first 10 million in five months. Then in 2012, S III shipments topped 20 million in 100 days, and now stand at more than 40 million. The milestones refer to global channel sales, also known as shipments to network operators and resellers, and not to actual sales to customers. Samsung is the top smartphone manufacturer in the U.S., according to the latest comScore report, with almost 27 percent of the market; Apple is second with almost 19 percent. Worldwide, iSuppli ranks Samsung as the top smartphone manufacturer too, with 29 percent of the market; those figures place Samsung above Nokia with 24 percent and Apple with 10 percent. It’s not just Samsung’s Galaxy S line that contributed to its success. As Farhad Manjoo explains in Slate, the company is flooding the market with various types of devices until it is able to identify what sticks with customers. This year, in the S line, Samsung also launched the Galaxy S III mini, and the Galaxy S II Plus, which sits between the S III mini and the S III in terms of specifications. 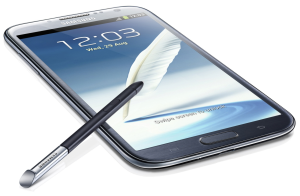 An example of something that stuck with customers is the Galaxy Note line of phone with displays larger than 5 inches. Dell had tried to sell 5-inch tablets with phone features but spiked the effort. Samsung, however, has found success with its line of oversized phones that measure 5 inches and up. Other vendors followed with so-called phablets of their own, while Samsung sold 10 million in its first iteration and another 5 million of the Galaxy Note II. With this apparent strategy, Samsung is set to sell 290 million smartphones this year, up 35 percent from an estimated 215 million last year, Strategy Analytics told Reuters. In comparison, the analyst firm expects Apple will reach 180 million sales this year, up 33 percent from last year. In the first half of 2013, Samsung is expected to launch the Galaxy S IV, the latest version of its flagship phone. An alleged leaked image of the upcoming phone has been published online; however no other details are available about the device.